The sanctuary currently operates one vessel in support of research and monitoring, education and emergency response. 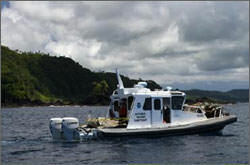 The R/V Manumā is a multi-purpose research vessel designed primarily to support sanctuary science and education missions. It also supports researchers from the National Park Service, American Samoa Department of Marine and Wildlife Resources, and other sanctuary partners. This rigid-hull inflatable has an overall length of 33 feet, and beam of 10.5 feet. It has twin 200 horsepower outboard engines, a fuel capacity of 200 gallons, and a range of 65 to 80 nautical miles. It carries a crew of two to three and a science party of five to seven for single day trips. Since it was acquired in 2009, the vessel has served as a platform for research and monitoring from diving operations to benthic habitat mapping, and for regional damage assessments and recovery efforts following the September 2009 tsunami. It is the only NOAA platform dedicated to marine research in the territory.